Hawaii allows you to complete your divorce without an attorney if you and your spouse can come to an agreement on what to do with your property and how you will care for any children that you have. At least one spouse must have lived in the state of Hawaii for at least six months before filing for divorce. Additionally, the spouse who files for divorce (Plaintiff) must have lived on the island within the Judicial Circuit where the divorce will be filed for at least three months before filing for divorce. A divorce can be obtained on no-fault grounds in Hawaii when the marriage is irretrievably broken. You file a Complaint for Divorce and Summons with the Circuit Court Clerk. 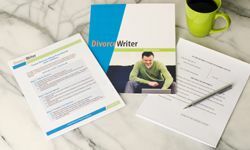 You hand-deliver or mail a copy of the Complaint for Divorce and Summons to your spouse, and you spouse signs an Appearance and Waiver of Service. In the alternative, you may select a reliable adult friend or relative hand-deliver the documents to your spouse. After doing so, the friend or relative completes a Proof of Service. You file a Decree along with a few other documents signed by both parties. The Judge reviews and signs the Decree without a hearing. Copies of the signed Decree are mailed to each spouse. DivorceWriter provides forms specific to the state of Hawaii and offers a money back guarantee if your documents are not accepted by the Court. You have qualified to use DivorceWriter to complete your Hawaii divorce papers online. Select "Continue" to start the interview.